The Kenton Theatre isn’t tiny but it’s certainly not a big stage, so the capable six-person ensemble cast is just right in writer-director Ian MacFarlane’s new take on an old tale. Not everything comes off in this reworking of Sleeping Beauty but it’s still an entertaining couple of hours. 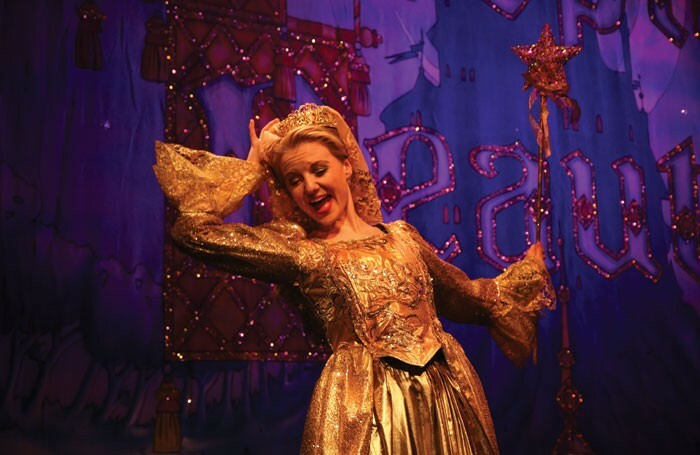 They act, sing and dance enjoyably, however what lifts it is the innocent appeal of Hannah Pritchard as a tomboy Princess Bea and Annabel York’s Fairy Light/Fairy Midnight – the latter as a sultry temptress. The prince is a surprise, with Thomas Ford giving a suitably preening performance as a gold shorts-clad Narcissus who was never likely to get the girl. Romantic honours go to his brother instead, a likeable Kieran Parrott. The question is how Ian MacFarlane’s production sees itself: it works as a fairy story and is strong on plot; but then it splices in pantomime elements as if to justify the description. So we have a funny jester and a busy Dame Trott – apparently inherited from last year’s Jack and the Beanstalk – slotted in from time to time. They’re good at what they do, but you do wonder why they’re there because they have little to do with the narrative and lead an almost parallel existence.